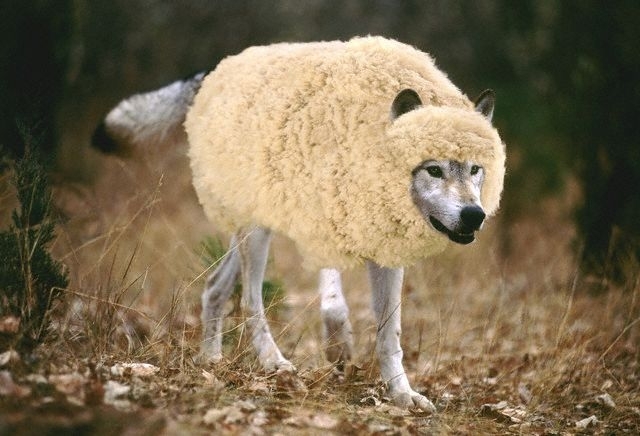 Unlike this image, where you can easily recognize the wolf in a sheep’ cloak, the science of propaganda, psyops and killings through conventional as well as ultra modern weapons has been perfected to such an extent that it’s difficult to differentiate between terrorism and its victims. Wolves as sheep and the sheep have been turned into monsters. To students of American foreign policy in Afghanistan and throughout the world, it is common knowledge that the United States military and Central Intelligence often act in a manner that is contradictory to the words of American leaders. To those who care to look behind the curtain of American duplicity, which casts a veneer of benevolence over our actions, it becomes readily apparent that “Islamic militants” tend to show-up wherever American oil companies have expressed an interest. America’s historical usage of the same militant groups in the past casts suspicion on their reappearance today, all along the pathway of the projected pipelines. It is much more than mere serendipity that militant actions usually target American adversaries, such as China, Russia and Iran. In addition, “Islamists” seem to also target disobedient American allies, such as Pakistan, who have fallen out-of-line, or otherwise failed to meet American expectations. Given our use of Islamist militants in Afghanistan to attack Russian forces, as well as in Bosnia, to attack Russia’s allies, the Serbians, it takes a very small leap of the imagination to see that the US is logically supporting the very militants our forces are fighting in the field. Former government translator Sibel Edmonds recently gave testimony in the court case of Turkish Islamic leader Fetullah Gulen, who was seeking a green card, which confirmed US/Saudi sponsorship of radical mosques and Islamists in central Asia. [Editor’s note: Wonders of Pakistan already put up two posts on Sibel Edmonds story last year in August, uploaded 4th August 2009. Readers can access this story by clicking on the links given at bottom as Related Posts]. There is every reason to believe that the IMU itself, is a CIA creation. According to the definitive history on this topic, given by author Steve Coll inGhost Wars,: “CIA Director William Casey, in a move exceeding his authority, decided to extend destabilizing propaganda measures inside the borders of the Soviet Union. To this end, the CIA promoted the Muslim religion in Uzbekistan, by CIA commissioning a translation of the Qu’ran into Uzbek by an Uzbek exile living in Germany, and then commissioning Pakistan’s ISI to deliver 5,000 copies. ” If the CIA did, in fact, supply the corrupted Islamic jihadi textbooks to the madrassas where IMU foot soldiers were indoctrinated in Uzbekistan, then it follows that whatever arose from them is also a product of the CIA. At this point, it is necessary to quote from official US military doctrine—from US Air Force doctrine paper Irregular Warfare, under “Support to Insurgencies”– “Various US government organizations are postured to recruit, organize, train, and advise indigenous guerrilla or partisan forces. These operations usually consist of supplying equipment, training, and advisory assistance to non-state actors. They may also involve US direct-action operations supporting specific campaign goals. ” American military and drug-interdiction missions in hot pursuit of IMU terrorists and drug-dealers provide cover for Special Forces operatives, who scout-out local leadership for further development, or termination. The “Irregular Warfare” document deals with leadership becoming targeted by both drone and PSYOP, as well. The Partnership for Peace programs open the door for an influx of thousands of American and NATO trainers, giving them bases for operations for “direct-action” missions, while it transfers tons of surplus military equipment to oil rich customers and sets the stage for joint military war games. “The incursions by the Islamic Movement of Uzbekistan (IMU) in the Batken Oblast of Kyrgyzstan in August 1999 exposed fundamental weaknesses in the Kyrgyz armed forces. Coordinated activities by the groups of armed insurgents confirmed that the state security bodies were unable to cope adequately with the tactics of guerrilla war…Despite the official claims made by the MoD, neither Kyrgyz security nor military units conducted successful combat engagements with the insurgents. This lack of success underscored a number of critical Kyrgyz military shortfalls that hampered their ability to effectively find, fix, and engage the hostile groups”. It is my hope in writing this, that it will help a little to reveal the awful knowledge that is being covered-up. No amount of oil or gas is worth the price that is being extracted from thousands of innocent human beings to pay for the war crimes that are being committed in this aggression. If American diplomats can maintain this precarious balancing act long enough, and if they work quickly enough to get some kind of peace/exit agreement in place, American forces might become able to openly move the pipeline plans forward, while they covertly militarize central Asia under the cover of fighting drugs and militancy. The former Soviet republics have very little, if any, independent news sources to let us know what crimes are being committed once the action slips into Krygzstan. Whatever happens next will be far beyond the eyes and ears of the world community. The writer, Peter Chamberlin has been actively opposing all non-defensive war most of his life. Peter’s first petition (as a teenager) was a success in his local community, raising several hundred signatures protesting Nixon’s scapegoating of Lt. Calley for the My Lai incident. He has been very active since 1982 writing letters to newspapers and magazines, as well as recalcitrant national leaders, speaking-out against war, nuclear war, and the impending violent collapse of the Western empire (that is now at hand). He has had several hundred letter-to-editors printed in this time. Peter is a world class writer & editor of ‘There are no sunglasses’ weblog..
Next PostIs India’s Regional Influence on the wane? I read this a few days ago. I thought it was a great post but I can tell you from experience that Peter is right, Americans haven’t a clue. They don’t have the time and they don’t care. They get their 5 minute news update from the television and then turn on “Dancing With The Stars” and fall asleep on the couch. That’s the average American citizen. They know even less about national politics and support the US government line. Again, in the 21st century it’s embarrassing and shameful to be an American. An excellent article by Peter indeed . It cirtainly reflects the multitude of the existing problem in the affected areas …Jeff , what to say about the common American people,even a well informed person can not put farward his remark on this article at first instance .therefore my comment will be not instant .I have to go through the article again to put farward some convincing conclusion . Balance is the law of nature……….It is the prevailing balance, we are managing world affairs to best of our ability .Technologies has bring about imbalance every where . Perhaps the center of gravity has got confined in the central Asian contries ,where almost all modern Armies of the world are confronting in an imbalanced condition therefore situation is grim there .It is not only US army but modern army of Pak and India are also cooperating with the rest of the world armies to maintain a balance there in their respective ways .It is not only the armies but spying agencies and governments have been conditioned to cooperate with each other .Afghanistan is the other CERN , showing us a site of international cooperation to minimise the loss of life as much as possible and every one has to contribute his best to maintain the balance since no one of us can afford the third war . Every body knows it very well that this struggle will be not for existance but it would be a struggle for extinction ……..It’s a common responsbility of us too .Peter it is not only oil but the factors beyond 2001 are also contributing in this mess .